It would be hard to argue that services like Hudl are not a tremendous help to Youth Football Coaches and their programs when it comes to simplifying the process of video review and sharing. Unfortunately, due to the nature of Youth Football many coaches have to pay for such services out of their own pocket. This has become even more difficult with recent price increases. In the following article we are going to outline a process using a relatively inexpensive video utility from AVS4YOU called Video Remaker and free Google Drive storage as a relatively inexpensive option. It should be noted that it is not a perfect process, but we believe for many coaches this would meet their needs. AVS Video Remaker has the capability of performing “Scene Detection” which when used with Football video can detect the start and end of plays. In the example video below, we show you how we import a video file into the Video Remaker utility and start the Scene Detection process. The Video Remaker tool does a nice job of automatically detecting the beginning and end of plays, but occasionally you will have a clip that either contains multiple plays or no video at all. In the case of no video, you can simply delete that clip. In the example video below, we show you how to split one video clip containing multiple plays into multiple clips/cutups. Now that the video has been edited for situations listed in Step 2, we are ready to create the individual cutups for upload into our Google Drive. In the example video below, we show you how to prepare the cutups for upload. The next step to prepare the video for sharing with other coaches is to upload individual files/cutups created in the Step 3 to our Google Drive. In the example video below, we upload our cutups to our Google Drive and rename the directory to something more meaningful. Once Step 4 is complete you are ready to share the video with other coaches. In the example video below, we show you how to create a shareable link that can be emailed to other coaches. Note: There are other more secure ways to do this, but for ease we chose to creat a shareable link anyone can view. In the example video below, we show you what it would look like from the perspective of a coach that has received the email sent in Step 5. You will notice that you can easly go to the next clip, as well as return to the previous one. Also, because Google Drive leverages the youtube player to play video clips you also have the ability to speed up or slow down each clip. Break videos down into manageable cutups. Easily share and access video with nothing other than a web browser. Slow down and speed up video playback. AVS Video Remaker is part of a suite of tools from AVS4YOU that can be purchased at the time of this article for $39 – $59 depending on whether you purchase a 1 year or lifetime subscription. Google provides 15 gigabytes of free Google Drive storage and depending on the quality of your video should easily be enough for a seaons worth of games. If you decide to try this process, we highly recommed that you get comfortable with the process before the season starts. Score on the First Series of the game. Score on the First Series of the second half. Score 21 points or more. Every wedge play that goes for 10 yards or more. Tackled while carrying out fake. Defender legally blocked to the ground. Only allow 7 points or less. Tackle behind the line of scrimmage. Kickoff return for a Touchdown. Punt return for a Touchdown. If you like us love to give out Awards to your team and are looking for high quality Helmet Stickers, we highly suggest you visit our friends at SportsLiveDecals.com. With the new season just around the corner and as a follow-up to our recent blog post concerning Minimum Play Goals in Youth Football, we thought it might be valuable to share some of the Minimum Play strategies we have picked up through the years. Please keep in mind that the intent of each of these strategies is to maximize player involvement while still being competitive and may or may not apply to your particular situation. Assuming a typical youth football game has around 60 plays and you have 2 Minimum Play (MMP) type players on the field for each play, that gives you a total of 120 (60 x 2) plays to meet your Minimum Play requirements. If you are like us and want everyone to get their plays in prior to the 4th quarter, you really only have 90 plays to work with. Since you can’t put more time on the clock, what can you do to increase the number of plays? Consider going No Huddle with your Offense. Think about the amount of time used during a game just huddling. There are many advantages going No Huddle and one of those is the ability to run more plays than a huddling team. If you just increase the number of plays run during the course of a typical game by 10%, you have added an additional 9 (90 x .10) plays that can be used to satisfy your play requirements. Use your timeouts at the end of the first half to stretch out the game and create more play opportunities. At the higher levels of football, it is a sound strategy when having the ball late in the first half without much chance of scoring to run out the clock so that you don’t give your opponent an opportunity for a big play. Unlike the higher levels, we as youth coaches are concerned with getting plays for all of our players. For more detail concerning this tip, we suggest you take a look at Coach Dave Cisar’s Creatively Managing the Minimum Play Issue in Youth Football blog post. Use an unbalanced line and place your weaker players on the “Quick Side”. Split a Receiver or Running Back out wide. This will typically move a Cornerback out away from the point of attack to cover that player for fear of a pass. If you prefer a balanced line, consider flipping your offensive line and having a strong/wall side and weak/quick side placing your weaker players on the “Weak Side”. For more detail concerning flipping your offensive line, we suggest you take a look at our Flipping Offensive Lineman blog post. Consider creating a Beast or Wedge team made up primarily of MMP players. This is especially an effective strategy when coupled with Tip #2. Consider utilizing the Cisar Wide Tackle 6 or Gregory 6-3 where you can utilize the two Defensive Guard positions to rotate players in. If you prefer an odd fronted defense instead, we suggest you take a look at the 73 Bandit and 7-Diamond Defenses. Designate boundary and field Cornerbacks. This strategy allows you to rotate players at the Cornerback position when the ball is either on the left or right hash where they don’t have to defend as much space. Utilize onside kicks on kickoffs. We suggest taking a look at our version of the “ABC” kickoff where three spots can be utilized for MMP players. On kickoff return utilize the two positions on the front line nearest the sidelines for your MMP players. As youth football coaches, it is our job to try and find places where all of our players can add value and find success. Though each of these tips will cause more work for your coaching staff, in the end they will hopefully help make it a more enjoyable experience for your players. If you are looking for minimum play strategies, we recommend that you take a look at one or our past twitter chats where coaches shared various ways they keep all of their players engaged, as well as one of our past blog posts covering Flipping Offensive Lineman. If you are looking for help tracking minimum plays, we suggest that you visit youth-football-plays-and-formations.com and check out their Minimum Play Planning Worksheet. For many Youth Basketball Coaches practice time is at a premium and if you are like us, you may struggle with balancing working on individual/team skills with scrimmaging. Because practice time is limited when we do scrimmage we want to make sure we get the most out of our time. One of the methods that have worked well for us through the years is playing a series of short games to 4 points with the losing team having to do something like sprints or push-ups. Since we are constantly emphasizing rebounding we add the rule that a score off an offensive rebound counts as 4 points. This really creates a sense of urgency and puts pressure on the players to play hard and since we are a pressing and fast breaking team this also has the added benefit of hiding some conditioning. 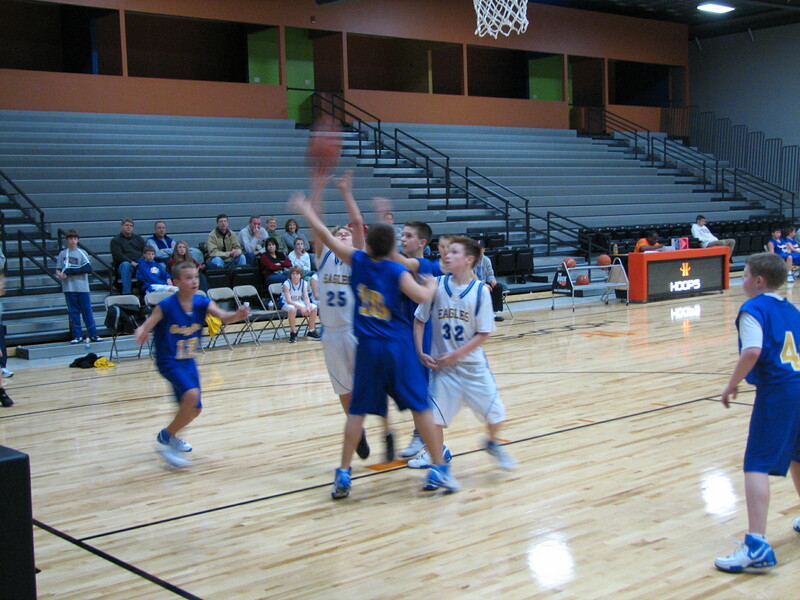 If you would like some other ideas to make the most of your Youth Basketball Scrimmages, we encourage you to take a look at the Maximizing Basketball Scrimmages article from coachingtoolbox.net. For the first time in my youth football coaching career I will be an assistant coach on a 3rd and 4th grade team. I have always felt the coaches at the youngest levels of youth football are the most important because they are the first to introduce the game. Because of this belief and since I am more experienced with coaching older players, I thought it would be a good idea for me to reach out to other coaches who are experienced at this level for advice. As expected, I got back some great responses that I felt are worth sharing. Keep it Fun! Many of the younger kids don’t initially understand the competitiveness of the game in the beginning. Give equal attention to all of your players. While your better players will improve you will see the greatest improvements from your weaker players. Have a good practice plan and keep the pace fast and efficient. Spend extra time on fundamentals and technique. Don’t assume players will understand all of the terms that you will use. Make sure to explain everything no matter how small. Hide conditioning within games and competitive drills. Do everything you can to make every player feel good about football. Make sure to communicate to the parents early and often. 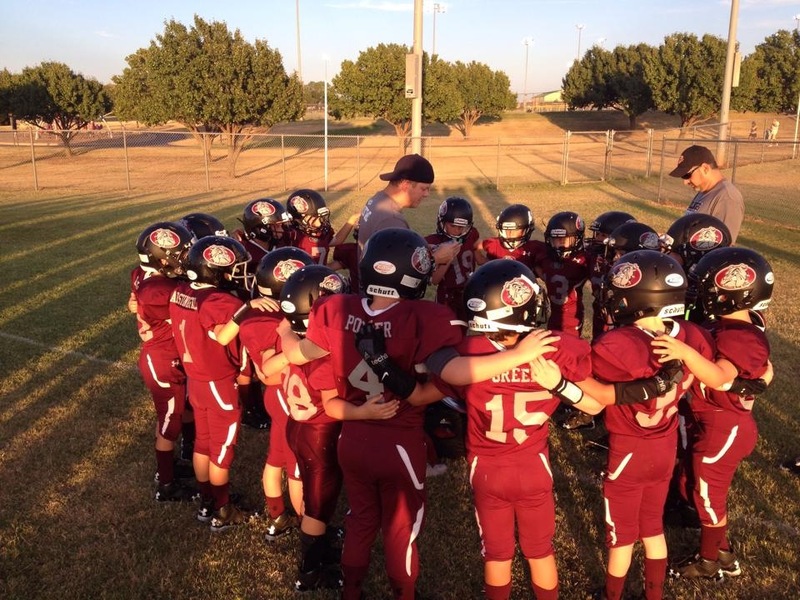 For many of parents this is their first exposure to youth football as well. 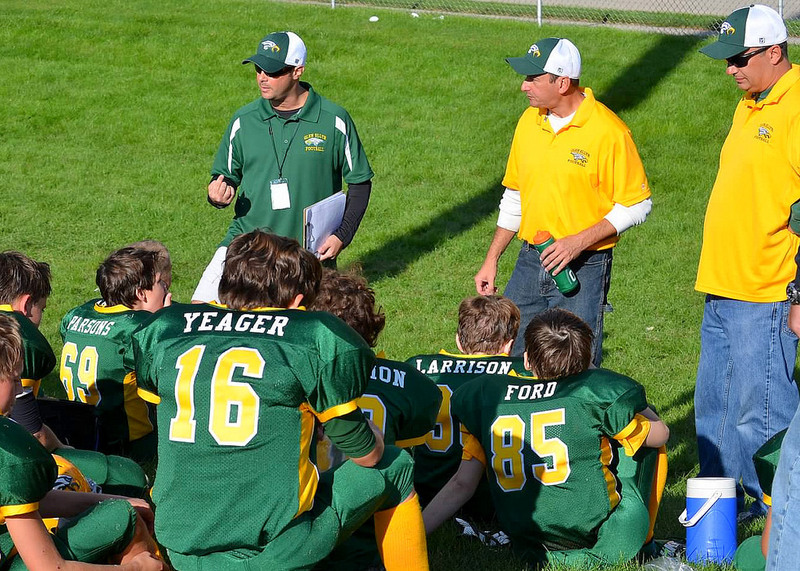 I’ve coached many youth sports over the past few years, but nothing near the magnitude of a tackle youth football team. I learned a few valuable lessons in year one that other rookie coaches could surely benefit from. Lesson #5: Experiment during practice and not in games. Early in the season I wanted to experiment with our cadence to draw the defense off side and to keep them from timing our snap. BIG MISTAKE! 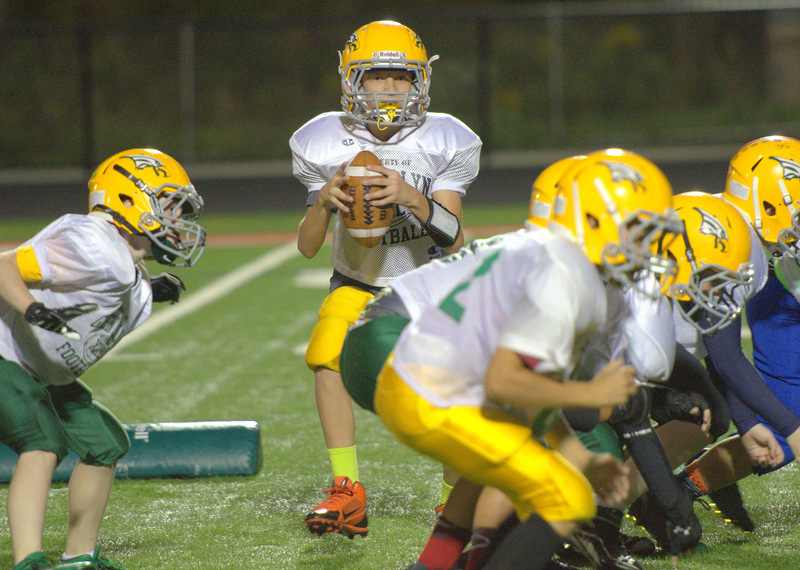 Recommendation: Do not vary the snap count in youth football. Doing so is almost as likely to cause a false start on your own offense as it is to draw the defense off side. Our offense is a Double Wing offense that relies on chipping away at the defense 5 yards per play. I thought that drawing the defense off side would basically be a free play each time. That is all fine and dandy when it works, but when your own players commit a false start instead the resulting 5 yard penalty is a potential drive killer. Teams that rely heavily on big plays can afford to lose 5 yards here and there. We cannot. I made the mistake of varying the snap count in a game without properly practicing it. The results were as many false starts on our offense as off side penalties on the defense. Once we changed our game plan and stayed with the same snap count, our false start penalties went away. Recommendation: Resist the temptation on Game Day to try and add any special adjustments, strategies, and plays you haven’t practiced. While you may be successful on occasion, more often than not you won’t achieve the result that you are looking for. Coach Atkinson coaches a 4th Grade team in Edmond, Oklahoma. Lesson #4: Youth Football Practice should be fun! Fun is the greatest motivator of all. Few kids will give it their all if they are not having fun especially at the younger age levels where they have not yet quite grasped the benefits of hard work. Based on this idea, hide conditioning in games/drills wherever possible. The benefits of this are two-fold. First, kids will try harder because they are having fun, and instead of wasting valuable practice time with sprints, etc… you can be teaching a skill. A good example of this is Tug O’War. We use Tug O’War to teach kids to stay low, while also building up their strength. They love this! In most of my individual competitive drills, I like to split the team into three groups. If you win your match, you move down a group. If you lose, you move up a group. Eventually each group is full of comparable players which mean they have a better chance of winning and thus having fun and building up confidence. As an example of what NOT to do… do not introduce contact with high speed drills such as the Oklahoma drill, Hamburger drill, or Bull in the Ring. These drills tend to make the top two or three kids a little more confident, but the rest of the team tends to become timid. Better ways to teach contact are drills like the Popsicle drill, Splatter Tackling drill, or Tee Time. These drills allow kids to focus on technique and get over their fear of contact. It also helps if you divide the kids into two or three groups based on size/skill level so that they continue to improve while building confidence. At this age, coaching is about teaching fundamentals, instilling confidence, and creating enthusiasm for the game. If these goals are accomplished the wins and losses will take care of themselves. Lesson #3: Choose a coaching staff that is both supportive and trustworthy. When choosing a coaching staff, I want assistant coaches that share these priorities. I also want coaches that provide different points of view and are not afraid to tell me when they feel I am making poor choices. I also need them to go with my final decisions, even if they are not in agreement. As I mentioned in a previous lesson, we like the Gap, Air, Mirror (GAM) defense for our age group. In the GAM down linemen play the A and B gaps. Defensive Ends line up “On Air”. Secondary defenders “Mirror” receivers… or play Man-To-Man. I had decided that there was really no way for an 8 year old Quarterback to receive a shotgun snap and get a good pass off in under 3 seconds while seeing heavy pressure from our defense. I decided to heavily blitz our Inside Linebackers rather than have them cover the offense’s receivers. This goes against the base GAM assignments. Don’t waste valuable practice time arguing with other coaches. Do this away from the kids and outside of practice. Be open to other coach’s suggestions instead of immediately dismissing them. Our first game of the season was against a team with tackle experience. Half of their team played for two years and the other half played one year. They ran a spread offense and with passing typically being unsound at this age and our fields being compressed, I assumed that they would be highly ineffective. I felt our heavy blitzes would get to the Quarterback before he could get any passes off. I was wrong. The first play of the game they attempted a jet sweep and we tackled them for a large loss. “Ha!” Our blitzing Inside Linebacker was the tackler. This means I must be right! Well, our Defensive End would have made the play if the Inside Linebacker hadn’t blitzed. The very next play we were beaten for a long touchdown pass as the Quarterback did get a pass off before our pressure got to him. I was stunned! I was eating crow for sure. I vowed to give more consideration to assistant coach’s suggestions and also to follow the GAM by the book, because had we done so we would have properly defended their receivers. We played the 2nd half of the game by the book and shut down their offense completely. We ended up finishing the game tied in our first tackle game ever against a very good and experienced team. Had I considered the concern my Assistant Coach had expressed earlier, we may have even won. We played the same opponent again later in the season. I had been coaching our Inside Linebackers to jam the receivers at the line of scrimmage. This would buy us enough time to get pressure on the Quarterback. Two of my assistant coaches disagreed and said we should cover the receivers instead of jamming them. They both played college football and said that jamming cannot be done against a skilled receiver that is aligned in the slot and is off the line of scrimmage. My response was “right… in college, or even high school, but these are kids”. One of the assistants was the same coach that told me I shouldn’t blitz our Inside Linebackers and leave receivers uncovered. He was right about that, but I was sure he was wrong about this so I stuck to my guns. Game time arrived and the first play of the game our opponent threw a long pass to a speedy receiver that landed right in his hands, but thankfully he dropped it. I emphasized to the Inside Linebacker that he was to jam that receiver and not to try and cover him. Next play was a jet sweep that our Defensive End stopped cold. Play three was another deep pass to the same receiver that dropped the earlier pass. Again he was wide open but this time he caught it for a touchdown. When our defense came off the field I asked the Inside Linebacker why he didn’t jam him like we had practiced. He said that his dad (one of the disagreeing Assistant Coaches) said not to… he was supposed to cover him. When I approached his dad, before I could even say a word he started laying into me that the receiver is too fast for his son to cover and we needed someone else on him. My response was “he shouldn’t have to cover him if he was jamming him instead.” After a slightly heated exchange, we both approached his son and said to jam him the rest of the game. Well, it worked. That kid never caught another pass that game. In fact, the next ball thrown to him was nowhere near him and was intercepted by our Safety. Mission accomplished so I thought. Next time they had the ball, they threw to another receiver that was being covered by my other Inside Linebacker that happened to be the son of the other disagreeing Assistant Coach. He soon got beat for a touchdown. I asked why he wasn’t jamming the receiver and his response was the same… his dad told him to cover instead. I told him to jam or he would sit out the rest of the game. He did as I instructed and we shut down their passing game completely for the remainder of the game, but we ultimately ended up losing the game. After the game, I had a major discussion with my Assistant Coaches. I explained that it was okay to disagree with me and that I made a mistake in the first game by not listening to their opinions, but that did not give them the right to undermine my decisions. I further explained that if they were unable to respectfully disagree and support my decisions, they were welcome to take their kids to another team. Lesson #2: Choose the best Defensive and Offensive systems for your Team. To accomplish #1, we would create a safe environment and coach sound fundamentals. To accomplish #2, we would give as much exposure to as many kids as possible. I would achieve this by choosing the best systems for our team. I started with defense because “Defense wins Championships” and if our opponent cannot score on us, we can’t lose. I needed a simple defense so I could focus my defensive teaching time on tackling fundamentals and so I could spend more time on offense. After some research, I decided that the Gap, Air, Mirror (GAM) defense was a very simple install that encourages aggressive play. As it turns out, it was a great defense for a first year tackle youth football team. The GAM is great at defending the sweep. At the younger levels, if you stop the sweep, you win (most of the time). Only one team scored on us all season long. They would not have scored on us at all if not for a few breakdowns that I will discuss in future lessons. For offense, I needed to keep it simple and wanted to limit our playbook to 12 plays. I wanted an offensive scheme that was run focused (because passing is not very effective at the younger ages) and I wanted to give as many players as possible an opportunity to carry the football. Realizing that most teams rely on the sweep and as such, the better coached teams will be able to stop the sweep, I wanted an offense that did not rely on the sweep to be effective. I researched extensively in this area and for my goals and the talent I had available, I chose the Double Wing offense. Of our 19 players, about six of them were quality ball carriers. Of those, I selected the one that stayed calm under pressure as our Quarterback. He was also one of three kids on the team with any previous tackle youth football experience. I used speed as the deciding factor for my starting Wingbacks and Fullback. The Quarterback choice was great, but two of the three others were not as good. You see, the Double Wing offense is about gaining 5 yards per carry by powering through the defense via the Super Power and/or the Wedge. One Wingback and my Fullback had a tendency to hesitate and dance around in the backfield rather than follow their blockers. Overall our offense was great as we led our league in scoring. Using the Wedge, I was able to give every single weight eligible player on the team an opportunity to carry the ball into the end zone accomplishing goals #2 and #3 above. The kids had a blast! Next season I will choose my starting backfield based on their tendencies to NOT hesitate or dance around, but rather trust and follow their lead blockers. I will also introduce drills like the Chaser Drill that will hopefully train runners to hit the hole more quickly. I will also choose to master a smaller playbook before moving on. I learned that 12 plays was too much to truly master at the very young age levels. There are several youth friendly Offensive and Defensive Systems available. I recommend these over a non-system offenses and defenses. The more popular offenses are Double Wing, Single Wing, and Wing T. The more popular defenses are the Wide Tackle 6, 6-3, 3-3 Stack, and the aforementioned GAM. 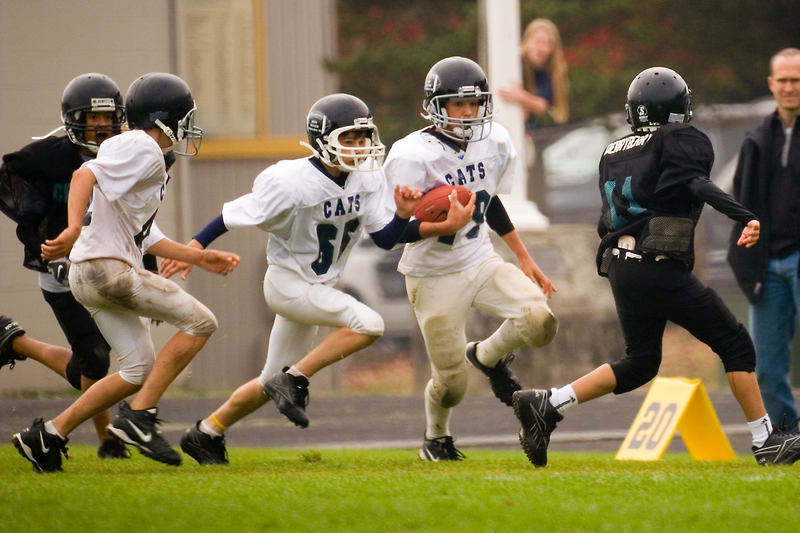 Choosing a particular offense or defense will not guarantee your youth football team victories, but they will give you an edge when all other variables are equal.